Vinca, also known as catharanthus or Madagascar periwinkle, is a popular annual flower. Growing upwards to 10 to 16 inches tall, with dark green leaves and five-petal blossoms in pink, mauve or white, these flowers spread quickly and require little care. While vincas have few problems, occasionally they will suddenly wilt and die. 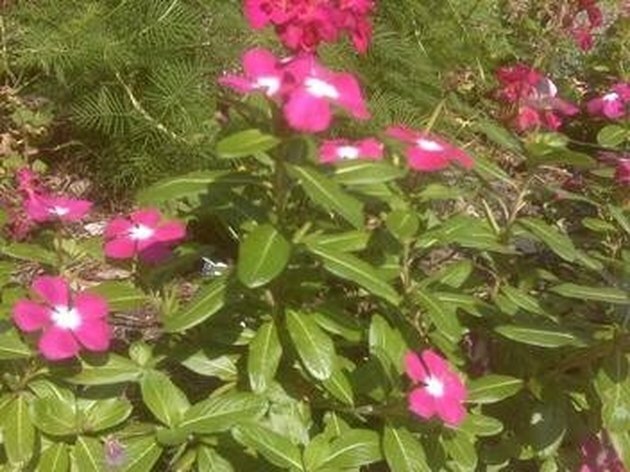 According to the Alabama Agricultural Experiment Station and Clemson University Extension, there are several diseases and fungus that can cause vincas to wilt, including phytophthora stem blight and root rot, pythium root rot, rhizoctonia stem and root rot, gray mold and the tomato spotted wilt virus. Symptoms of these diseases and fungus include dark colored lesions on the stems and branches, yellowing leaves with stunted growth, spots on the foliage, gray mold on the plant or black concentric rings on the leaves. Many of these diseases and fungus are prevalent in soil that has poor drainage or gardens that have been watered incorrectly. Select healthy vinca to plant in the garden. Enrich the garden's soil with well-rotted manure or compost before planting to help increase the soil's moisture-retention. Do not plant the vinca deeply and space 8 to 12 inches apart to allow for air circulation. Vincas need about 1 inch of water each week; if rainfall is insufficient, avoid overhead irrigation systems and water deeply in the early morning to allow the plants time to dry before nightfall. Remove and destroy any affected plants. Treat the remaining plants with a fungicide; contact your local extension office to determine which fungicide is needed. Why Are My Petunias Dying? Why Does My Mandevilla Plant Not Bloom?